Robert Foster is back, and in a big way. With the October 2015 launch of Spartan Mowers, the owner of the Intimidator Group, headquartered in Batesville, Arkansas, could not be more proud. “I have always loved mowers. They are a passion of mine. The Spartan is truly a culmination of many years experience, many lessons learned, and countless hours of work and engineering. We literally built this mower from the ground up. The inspiration for the design of the mower came from the muscle car era of the 60's and 70's,” says Foster. See more about our Spartan Zero Turn Mower here! The Spartan features all new Smart Ride Technology [SRT] with middle and rear Elastomer TecsPak® and front neoprene cushioning to absorb any shock or jostling. Another selling feature of the Spartan includes the soft ride steel belted radial tires. The Ergonomic Cockpit puts the driver in the center of the circle; the new brake system frees up arm space, giving the driver the ultimate ride and range of motion. Drivers will also appreciate the LCD Control Panel and Warning Indicators, one of the first mowers to offer this feature. The Spartan cut is second to none. Boasting a shock-assisted lift deck and certain models with an electric actuator, deck lift is simplified. The low center of gravity and angled front forks allow for a close cut through the straights and turns. The Spartan frame is built with the same heavy duty frame as Intimidator UTVs. 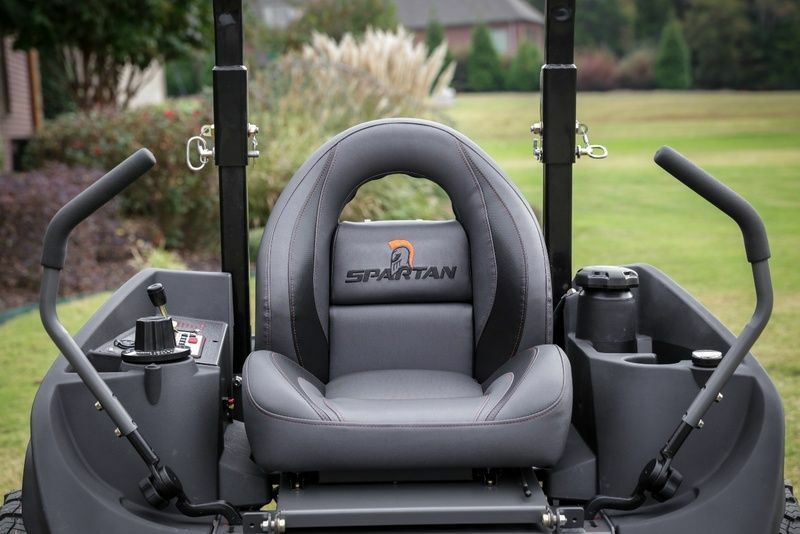 Spartan mowers are also designed with a simple “plug-and-play” system to allow the owner to add on whatever accessories necessary. “The mission behind this mower was to change the turf industry by raising the bar on simplicity and fuctionality in a top of the line mower. We did it...this one is special. We believe the Spartan is the best possible mower on the market,” says Foster. All of these top of the line features create an outstanding mower at a lower price. Starting price for the base RT model is $4,995. There are five mower series – RT PRO, RT HD, SRT PRO, SRT HD, and SRT XD, accommodating everything from small yards to commercial use. For more information, visit www.SpartanMowers.com.